It's true. I've been off the writing bicycle for so long that I've forgotten how to ride. As I sort this out and drown my sorrows in ink and strangeness, please enjoy a sneak preview of something positively retarded that I'll be posting a review of soon. "currently manning the Writer's Blockade"
I posted this on a forum a while back, but still struck me as kind of neat so I'm sharing. Mostly because the few webcomic heads out there might dig it, trivia-wise. If you read the comic 8-bit Theater (nuklearpower.com...that sprite comic with characters and visuals from Final Fantasy Uno) and have for a while, you'll know that Brian the creator is/was a huge City of Heroes fan. That was the game that swallowed my soul and free time earlier this year. Anyway, years ago he posted pictures of his character, Atomic Robot doing all sorts of things in City of Heroes and generally was the reason I heard about this game in the first place. Now, his character on City of Heroes is getting his own comic. It kind of raises a weird copyright question. If I build and design my character to exist within someone else's game, do I have ownership or not? Is there some clause in the agreements that gives me copyright of whatever I create? It's kind of weird territory as one's log in name is, in some circles, a real character. A real character that eventually gets his own comic series. There use to be more Atomic Robo stuff online, but now that the comic book is out, they've revamped the sites to not have any of the City of Heroes screen captures that used to be there. That was from June 2004. And now, Red 5 comics is launching "Atomic Robo" the comic. Like, yesterday. This may be one of the first times someone has created a character in City of Heroes and, 3 years later, is getting their own adventures published in comic book form. 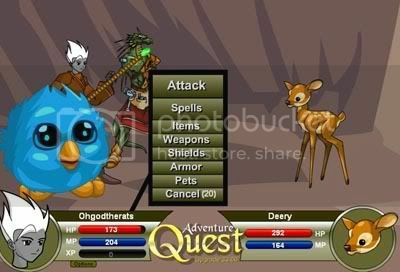 Obviously the character has evolved, but it's still fun to know I'm playing an online MMRPORG (or whatever) game that inspired something like this. Because the world needs more robots that fight nazis...and this gives people addicted to games hope. Well, creative people that is. You other losers are screwed. Spooky but, well, yeah. I'll say no more. :warning: This post contains a naughty word. You know you love it. 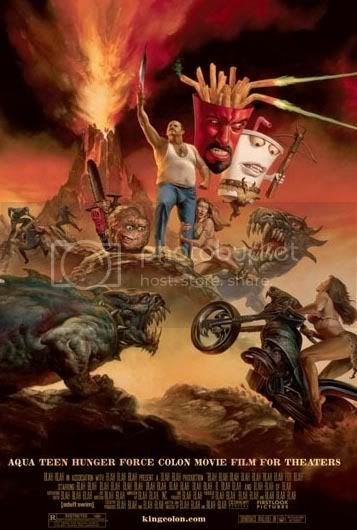 I'm not going to lie and say it's an awesome movie. 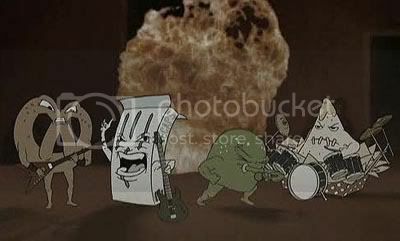 It is, however, a rather awesome episode of ATHF that's gloriously long. I guess what I'm saying is that some movies based off tv shows twist the concept into something grander (Think Charlie's Angels....or how the new Simpsons movie has the Simpson family saving the world or some such craziness). While the movie isn't too different from a regular episode (which is awesome for us fans) the opening is something of legend. Let me walk you through it; I think I have no choice. 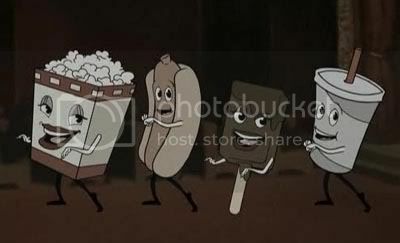 While they don't sing "Let's all go to the Movies" it's pretty much the same thing. It's pretty straight forward and kind of cute. Halfway through their song they're interrupted. You came here. Watch it. Don't like it? Walk out. We still have all your ****ing money. 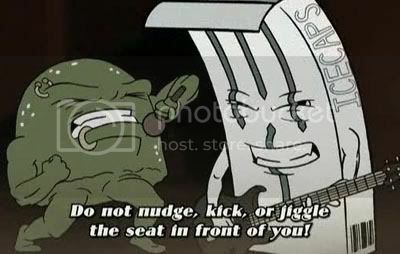 Do not nudge, kick or jiggle the seat in front of you. and I will cut you up. Do not explain the plot. If you don't understand, then you should not be here. and we will spend it on drugs. Do not crinkle your food wrappers loudly. and give you a disease. Take the seed outside. Leave it in the streets. Run over it after the show. and turn your guts into snakes. 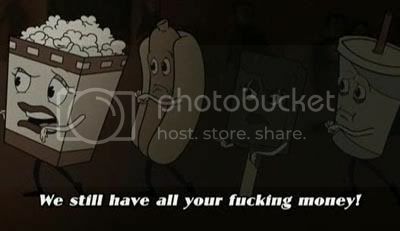 This is copyrighted movie for Time Warner. and tear your wife in half. Just had to share. Talk to you later, boys and girls. I love the fact that my movie collection is a mysterious pile of stuff my rental store decided they needed to throw away. When I picked it up it was literally giant garbage bags of old movies that most of us hadn't heard of. So when I spend a weekend painting and watching bad films, I always stumble across something new. 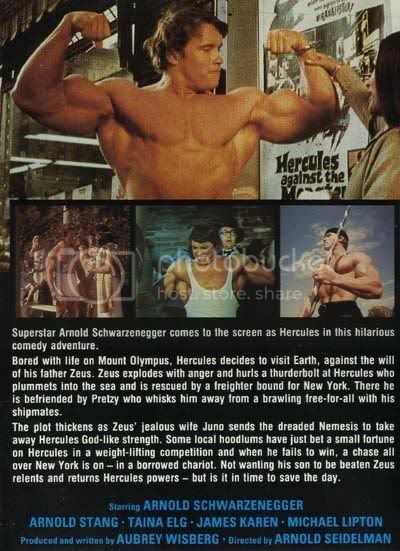 Also known as "Hercules with Muscles", this tribute to late 1960's bodybuilding, Hercules movies, and bad comedies about life in New York was AMAAAAAAAAAAZING. Mostly because while it has Arnold in almost every scene, it has someone else entirely doing the voice. To put that in context, just image that George Bush started talking like Bugs Bunny. It's sort of an improvement but it's all too unsettling. If that makes any sense at all. Edit: Review forthcoming. Because more people need to know about the time Arnold wrestled with a man in a bear costume.